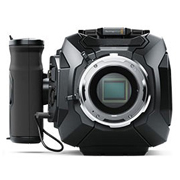 Now in a smaller, more handheld friendly form factor, the URSA Mini 4K Digital Cinema Camera PL from Blackmagic Design can record cinematic images with its Super-35mm 4K, global-shutter sensor with 12 stops of dynamic range. The ergonomic body design is balanced and can be used for many different styles of filmmaking. The PL-mount is compatible with a plethora of popular lenses, opening up different aesthetic options. A rosette on the side of the camera accepts the included side handle which can control start/stop via a LANC connection. To produce cinematic images, the URSA Mini can record raw sensor data in the CinemaDNG format onto CFast 2.0 memory cards at up to 60 fps. The raw files preserve the full dynamic range and color tonality output from the sensor so you can have greater control over the look in post-production. However, data-heavy uncompressed raw files aren't always easy to deal with on-set, so in addition to uncompressed raw recording, the 4K URSA Mini provides compressed raw recording at a 3:1 compression ratio to save space while retaining post-production flexibility.